It is evident that many people coming from the historic region of Cieszyn Silesia (from the Czech Republic and the Republic of Poland) are rather unfamiliar with the history of the region, and hence also historical cultural events connected to this region. Therefore, this project endeavours to draw attention to the reciprocal interchange between these two cultures in the border region of Cieszyn Silesia. Insufficient cooperation between members of both nations seems to be one of the problems regarding the preservation of the common cultural heritage of Cieszyn Silesia. We would therefore like to address this issue in this project. The aim of the project is to commemorate the 100th anniversary, which, in 2018, marks the establishment of the two independent states, i.e. Czechoslovakia and the Republic of Poland. We also strive to provide a reminder of the history of the Polish minority residing in today’s Czech territory. To mark the above stated, the unique architectural objects created by Czech and Polish architects in both states during the inter-war period will be introduced. Since Cieszyn Silesia was, with regard to the centralisation of research and the history of art (and hence also architecture), beyond the field of interest of modern and contemporary art researchers, we would like to change this fact as much as possible. 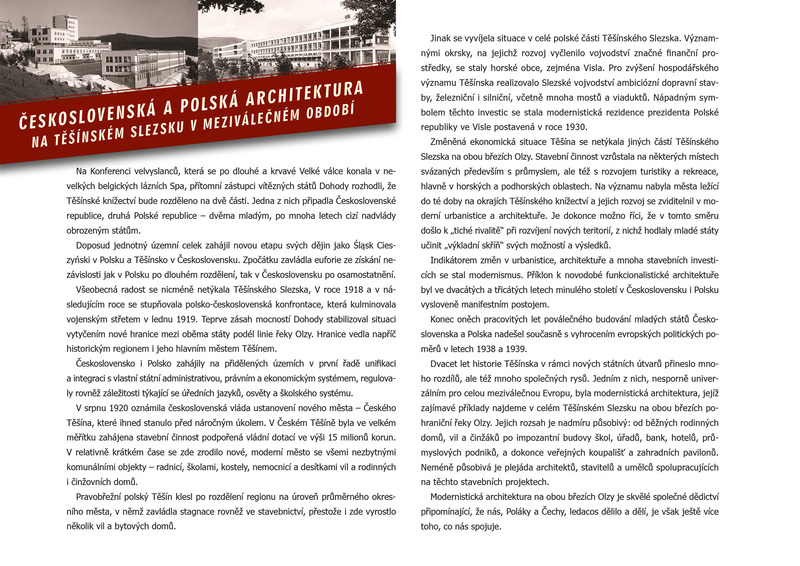 Therefore, the project focuses on introducing the general public to the unique development of Czech-Polish architecture in Cieszyn Silesia during the two decades of the 20th century. We would like to enhance Czech-Polish cooperation in this region.